The 35th edition of Cersaie, the annual international exhibition of ceramic tile and bathroom furnishings, is almost here! The five-day event takes place at the Bologna Exhibition Center in Bologna, Italy from September 25-29, 2017. If you’ve never attended this show before, then prepared to be in awe! Most importantly, bring comfortable shoes because there’s a lot, and I mean A LOT, of to see! 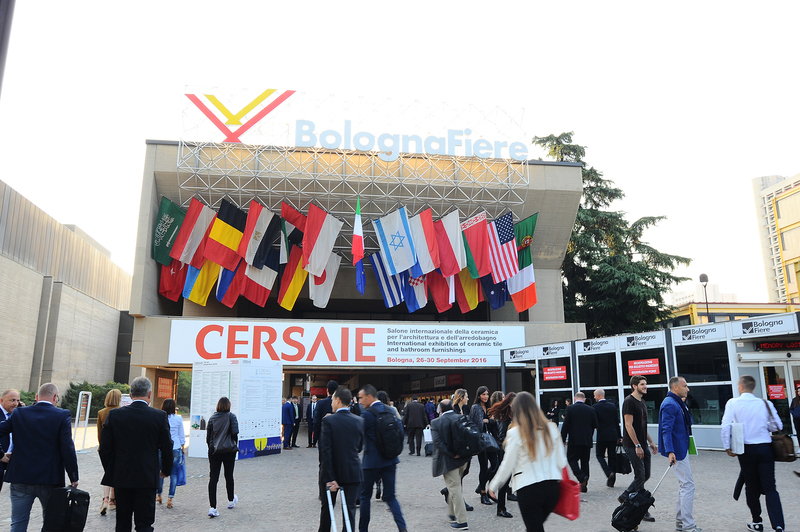 Cersaie attracts more than 800 exhibitors from around the world including architects, interior designers, tile installers, distributors, and more. Did I mention you need to bring comfortable shoes? Happily, I’ll be among a delegation of roughly 50 architects, designers and journalists from across North America traveling to the exhibition, thanks to the Italian Trade Commission and Ceramics of Italy! To say that I’m excited is an understatement! You have no idea how much I’m looking forward to seeing, touching, gawking and sharing all the Italian tile eye-candy I come across. Just so you don’t miss a beat, make sure to follow Tileometry on Instagram, Twitter and Pinterest so you too can experience all the new, trend-setting tile designs, patterns, colors, textures and sizes! Ciao bella! Cersaie is organized by Edi.Cer SpA and promoted by Confindustria Ceramica in collaboration with Bologna Fiere. Visit the Cersaie website for more information and details about the various showcase events.